James Brown was probably the most biggest, baddest, and blackest performer to come out of the Age of Rock. His on stage antics, music and dance were legendary and duplicated by many including Mick Jagger who also produced this film. Everyone remembers when we would collapse on stage and his attendants would lift him up and robe his shoulders only to have him shrug it off and when the audience would revive him for one more chorus. It was magic. Director Tate Tayor (The Help) with screenwriters Jez Butterworth and John-Henry Butterworth has managed to condense the rather colorful and complicated life of Mr. Brown (as he liked to be called) into a worthy tribute to the Godfather of Soul. Chadwick Boseman who also portrayed Jackie Robinson in 42 takes on another bigger than life personality as James Brown. The story is told in a non linear style jumping from time to time like recalling memories. One moment it's Brown on the downside of his career shooting guns off in an office space because someone there used the bathroom in his office next door. The next we are seeing the Brown as a child raised by a drunk abusive father and a mother who abandons him in a small shack in Augusta, GA (Viola Davis and Lennie James). He goes to live with Aunt Honey (Octavia Spencer) the madam of the local bordello and works at bringing customers to the house. As a teenager he gets busted for stealing a suit and sent to prison where he meets Bobby Byrd (Nelsan Ellis of True Blood) who sings with a gospel group at the prison. Byrd is impressed when he hears Brown sings and asks his parents if Brown can live with them, the only way he could be released from jail. The young men form a band called the Famous Flames. Byrd has to admit that Brown is way more talented than he is and soon Brown is calling the shots. Brown's musical genius is tempered by his childhood traumas, and he's often magnetic, tyrannical and paranoid. His ego is huge, too large for most rooms. When the record manager Ben Bart (Dan Aykroyd) comes into the picture, he only wants Brown, the Famous Flames are dropped. Only his best friend Byrd comes back to perform with Brown's various bands over the years before he's eventually alienated by his best friend. Mother and son are reunited after Brown is famous, but he cannot forgive her. It's an intense and telling scene about the painful childhood that haunts Brown. Then there is the music which makes one want to dance in the aisles. There should be more of his music filling this movie. There are surreal moments like when the young Brown (played by twins Jordan and Jamarion Scott) walks into a church and is mesmerized by the singing and dancing preacher, or when Brown and band are performing on a white TV show in bad Christmas sweaters. There are moments when Boseman/Brown talks to the camera in narration of some of the events. 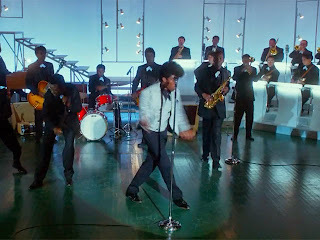 The movie touches on crucial moments in Brown's life like meeting Little Richard, performing for troops in Vietnam and almost getting blown out of the sky. It touches on his spousal abuse, band abuse, and drug abuse all during the turbulent years of the racial awakening. There's a lot of story to tell to do justice to such a complicated man. The flashbacks and flash forwards are sometimes too distracting in the movie, but the performance by Boseman is notable and should be rewarded.